Readers of this blog know we don't do a lot of Italian wines. Less than 1% of our cellar is in Italian labels. There are so many appellations and varietals and producers across all the regions, I advise folks to find one you like and focus on a few to develop knowledge and understanding of that area, and then move on. We focus on Bordeaux and Bordeaux varietals (Cabernet Sauvignon, Merlot, Cabernet Franc, Petit Verdot...) and Rhone and its varietals (which includes Syrah/Shiraz and thus includes Australia's popular varietal). I admit, I am not well versed in Italian wine regions and their associated grape varietals. I've written before that in the 'new world', we name or label our wines based on the primary grape varietal in the bottle. In the 'old world', they, (the French, Italians, Germans), name the wine for the region or appellation, and its up to the consumer to understand the applicable wine grape varietal associated with that area. For example, Left Bank Bordeaux appellations (growing areas) such as St Julien and Paulliac are Cabernet Sauvignon based blends, while Right Bank Bordeaux such as St Emilion and Pomerol are Merlot based blends. In this case of Italy and Barolo, the wines are based on the Nebbiolo grape varietal. Perhaps this is obvious, but the neophyte, or even learned wine geeks who don't know Italian wines, don't necessarily know the association of Sangiovese or Nebbiolo varietals and their regions and appellations, Barolo, Piedmont, Tuscany etc. Skip ahead if this is known and basic, or bear with me if you're interested in learning these fundamentals of Barolo which is a Denominazione di Origine Controllata e Garantita (DOCG) (aka appellation in France or AVA (American (Agriculture) Viticultural Area) in America) in the northern Italian region of Piedmont. 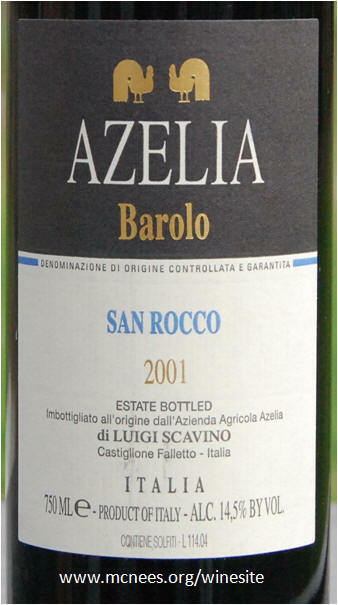 Barolos are red wines made primarily from the Nebbiolo grape varietal. Within the Piedmont Barolo DOCG are the communes of Barolo, (in this case) Castiglione Falletto and Serralunga d'Alba, and parts of the communes of Cherasco, Diano d'Alba, Grinzane Cavour, La Morra, Monforte d'Alba, Novello, Roddi and Verduno. These sub-appellations as they might be called in America, are mentioned on the label, but are secondary to the region name. To many, me included, this adds to the confusion of interpreting or parsing an Italian wine label. Barolo wines tend to be bold, full bodied, tannic, firm, concentrated and long lived with tasting characteristics of black fruits, tar, rose petals and smoke. Readers of this blog will also know that we dine regularly at Angeli's Italian, our local trattoria, and when we do, we're limited in our Italian focused BYOB selections if we want to stay true to the native food wine pairing. Tonight, for a casual mid-week dinner, I pulled this bottle from our limited Italian selection in the cellar with little foresight or understanding on what to expect in this fourteen year old. Wow, what a nice surprise. This Barolo was a blockbuster, a perfect accompaniment to our entree selections, Portabella Mushroom Ravioli with ricotta cheese, sauteed in marsala wine cream sauce, and the daily special, Asparagus Ravioli. Dark garnet colored, full bodied, expressive complex concentrated but nicely integrated fruits of blackberry and black currant fruits highlighted by tones of tar, anise and smoke, and subdued earth and tobacco leaf notes, turning to firm but smooth polished tannins on the lingering tongue puckering finish. I will look forward to exploring and adding more Barolo including this label to our wine acquisitions and selections in the future.